It’s Tuesday again and you know what that means! Time for another Tombstone Tuesday. 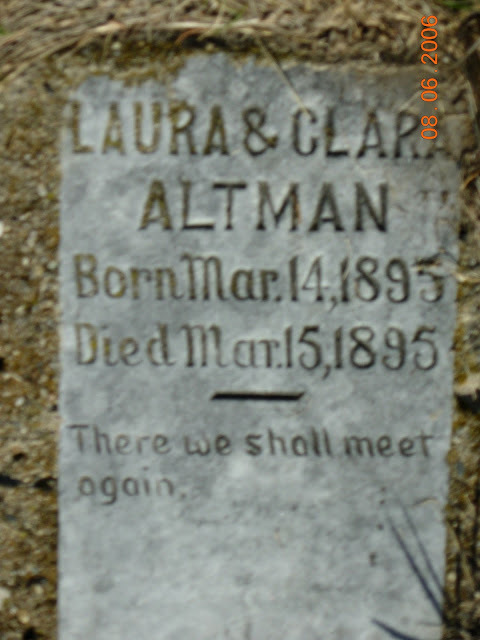 Continuing our journey through Anselm Lutheran Cemetery, today’s tombstone belongs to two of my paternal cousins, twice removed, Laura and Clara Altman. Clara was the second of seventeen children of Robert Altman and Albertina Amelie (Lange) Altman. She had five brothers (all younger) and eleven sisters (one older and ten younger). Laura was the third of seventeen children of Robert Altman and Albertina Amelie (Lange) Altman. She had five brothers (all younger) and eleven sisters (two older and nine younger). Clara and Laura were both born on 14 March 1895 in Anselm, Ransom, North Dakota. They died 15 March 1895 in Anselm, Ransom, North Dakota. They are buried together in Anselm Lutheran Cemetery in Anselm, Ransom, North Dakota. Their tombstone inscription reads: “There we shall meet again.” The cemetery borders what used to be family farmland.